Have you seen nature programmes about animals that look like a large shaggy grey rug with a vacuum hose on the front? Then you’ve probably been watching anteaters – or more specifically, Giant Anteaters, since they don’t usually make programmes about the other three, less charismatic, species in the family! Among other things, Anteater Facts explains why such large animals made a damning decision to satisfy their hunger by mostly feeding on ants. Here are 20 interesting facts about anteaters. 1 – The Latin term for anteaters, Vermilingua, means ‘worm tongue’ and refers to the ultra-long and flexible nature of their tongues – mind you, they need them to reach the small, underground insects they live on! 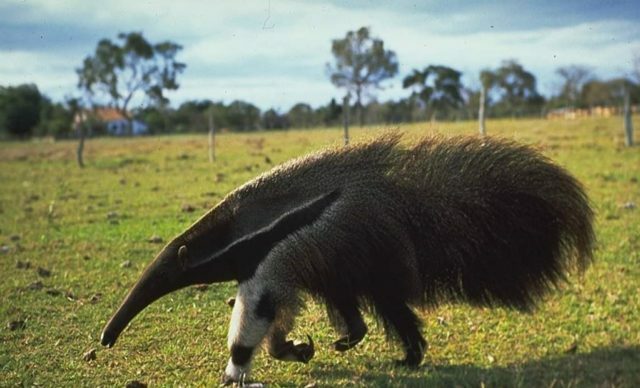 2 – One of the unknown anteater facts is that there are four species of anteaters, although most people know of only one – the Giant Anteater, Myrmecophaga Triactyla, also known as the ‘antbear’. At around six to seven feet long including its tail (1.8-2.1 m) and up to 100 lbs in weight, this is easily the largest of the group (hence the name). 3 – The other three are the medium-sized Southern Tamadua (Collared Anteater), Tamandua tetradactyla, about four feet long (1.2 m); and the two smallest ones, both just over a foot long (35 cm), the Silky Anteater, Cyclopes Didactylus, and the Northern Tamandua, Tamandua Mexicana. 4 – The three smaller species are considered to be in no danger at the moment, but the Giant Anteater is classified as ‘vulnerable’ as there are believed to be only around 5,000 left in the wild, and with poaching and the destruction of their habitat this is likely to keep decreasing. 5 – Their nearest relatives are sloths and armadillos, and these three animals form the Superorder Xenartha, which means ‘strange joint’ in Greek, and refers to the fact that the vertebrae in their lower backs have special articulations found in no other animals. 6 – Although aardvarks and pangolins look very similar to anteaters (and are often, wrongly, called ‘anteaters’), this has been discovered not to be because of a common ancestor, but conversely, because they have evolved along similar lines and therefore grown to look like each other. 7 – In order to best cope with their preferred menu of ants and termites, anteaters have developed in unusual ways. Their snouts have become very elongated, they no longer have teeth and their tongues can extend to more than the length of the head again – nearly two feet in the case of the Giant Anteater! 8 – Anteaters have very long, non-retractible, curved claws on their front feet that are simply curled under when they move, so they walk on their knuckles. They use these claws to tear open the insects’ nests in order to reach the ants and termites – and to defend themselves, when necessary. 9 – The ‘shaggy rug’ effect is caused by their very long, dense fur, which protects them from the revenge attacks of the insects, some of which can deliver a very painful bite or sting when provoked. 10 – Along with the very sticky saliva, anteater’s tongues are covered with thousands of little hooks which help to hold the insects long enough to swallow them, while the tongue (which is attached all the way down at the sternum, not just at the jaw) will flick in and out very quickly, up to 150 times a minute. 11 – Anteaters don’t see too well, but they make up for that with an excellent sense of smell, which they use to find the anthills and termite mounds they need. It is around 40 times better than our human noses. 12 – The family of anteaters have one of the lowest body temperatures of any mammal, around 33-36ºC (91-97ºF). This is because they take in only slightly more energy in their food than they expend in living, so a low body temperature means they waste less energy when resting, only warming up when they need to be active. 13 – Anteaters don’t make many sounds at all; the males have a drawn-out cry sounding like ‘harrr’ when threatening another male, and they can bellow and roar when actually fighting, but that’s about it, usually. 14 – Anteaters are found in Central and South America, from the southern edges of Mexico down to Uruguay and Brazil. The Giant Anteater is entirely terrestrial and lives in grasslands and savannas, but its three smaller relatives all spend much of their time in trees – almost exclusively, in the case of the little Silky Anteater – and are therefore found in forests and woodlands as well. 15 – To catch their prey, anteaters flick their very sticky, saliva-covered tongues into ants’ nests and termite mounds, then retract it with insects and eggs stuck on. The prey is scraped off in the mouth by the jaw and simply swallowed, where their very muscular stomachs grind them up and digest them. 16 – Despite their name, anteaters don’t only eat ants (and other small insects), they will also eat fruit if they find it on the ground; and all except the Giant Anteater will climb to find it as well; the Giants can’t follow that example so they only eat what they find already fallen. 17 – In order to avoid being bitten or stung excessively (despite their thick coats), after breaking open an anthill or termite mound, anteaters will only spend about a minute grabbing as many inhabitants as they can before moving on – and a Giant Anteater has to repeat this up to 200 times a day to get enough food to survive! 18 – Anteaters are normally solitary, occasionally they mate which actually occurs briefly. The only real exception is when a mother anteater will be with her baby for the first two years or so of the youngster’s life. Otherwise, anteaters have very specific territories and although the females’ areas can overlap a little, males will not usually enter another male’s area at all. 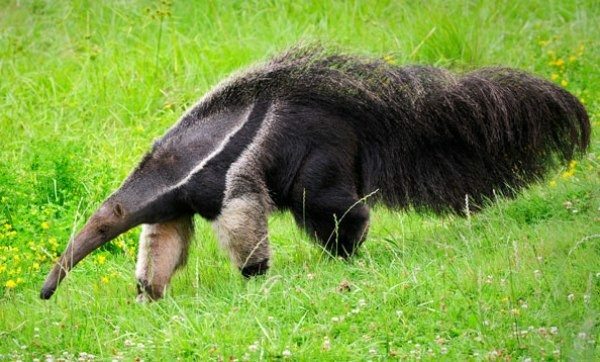 19 – Giant anteaters are pregnant for about six months and give birth to usually one live young (twins are possible but very rare), which will nurse from the mother for several months. In order to avoid predators the youngster spends most of its first year or so clinging to its mother’s back, and even when it’s too big for that it will stay with her anyway until it’s about two years old – or until she gets pregnant again. 20 – The fact that anteaters, particularly Giant Anteaters, have become more popular in recent years is reflected in their appearances in popular culture – they now feature as major characters, eg in books and on TV. For instance, ‘Peter the Anteater’ is the mascot of the University of California, Irvine; ‘Francis the Anteater’ is a soft toy who has his own Facebook page, and the internet series ‘Happy Tree Friends’ has an anteater character called Sniffles!